Podcast #30: Being Michael Madsen (2007) | Why Does It Exist? FIGHT THE POWER (OUTAGE), HARRY DEAN STANTON IS ON FIRE, PAIGE DAVIS? 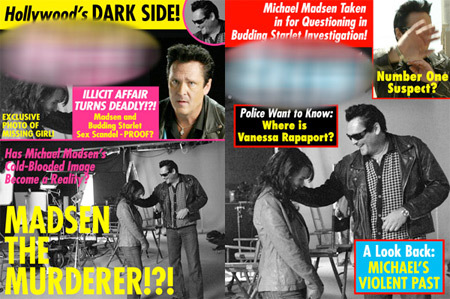 If tabloids were more about Michael Madsen and less about the okra that gave Oprah superpowers, I’d probably read them. If there’s one thing we enjoy here at Why Does It Exist?, it’s enabling B-list celebrities to stroke their own ego through would-be satirical movies about the cold, callous and lifeless desert that is Hollywood. Before there was Not Another Not Another Movie, however, Michael Madsen starred in another ‘comedy’ of dubious satirical value. Being Michael Madsen is a reality-bending mockumentary which chronicles the heady days when Michael Madsen changed the world of celebrity forever by hiring a documentary crew to harass a paparazzi, thus ensuring that the hunter become the hunted and securing the world from their prying eyes until Bieber would once again change the core temperature of Earth by maybe tripping over somewhere around a paparazzi. Along for the ride are luminaries like Darryl Hannah, Harry Dean Stanton, Madsen’s ego, Virginia Madsen, Madsen’s hubris and Lacey Chabert. Music this week provided by Brusque Twins. The song A Voice in the Night off their Voice in the Night EP can be found here.